Our 14e release is imminent. But after looking at our survey results and the most recently reported issues, we thought it wise to provide some hints to help you use the current software and to help you understand tradeoffs we made. Our most commonly reported issue is something we struggled with. In an attempt to help users understand features we caused confusion. What are we talking about? There are pop up windows: some of which should be Continued some of which should be Stopped. The only notification tool that works across all versions of Photoshop reliably doesn’t allow much customization, so when confronted with each of these dialogs, its understandable why some people click Stop when they should Continue and click Continue when they should Stop. The pop-up window below was the worst. We added highlighting to make it easy to see the difference, but we can’t use color or graphics on the actual pop-up without creating compatibility problems. Do you notice the difference? Once there is any kind of error it’s time to Stop and restart because manipulating layers in Photoshop is a little fragile. The good news is the first pop-up can be turned off. The better news is that in 14e we have already turned it off for you. In fact in 14e we’ve trimmed down interaction as much as possible but still kept the awesome extra features. Here is how to turn off the first pop-up (the one regarding Watermark Alignment) in version 14d and earlier. The Advanced Stacker PLUS derives much of it’s power from two key things: Photoshop’s ability to batch process images AND Photoshop’s ability to open just about any image format on the planet. Batch processing works because it is possible to use File -> Automate -> Batch to hurl a handful or a folder full of images at customized scripts and actions. While Adobe Photoshop Elements has a “batch processor” there is no way to do operations other than those that are built-in to the software and that’s why ASP doesn’t support Elements. One of the weaknesses of using Photoshop’s captive power is that it requires exploiting the tool in ways that are “allowed”. While we like Adobe Photoshop CC, there are still many people who are very happy with older, non-cloud versions of Photoshop like CS3 or CS4. We chose to not abandon that 35% of our customers so we support ALL CS versions of Photoshop on both Mac and PC. and that means we limit our actions and scripts to features that are common across all those versions and platforms. 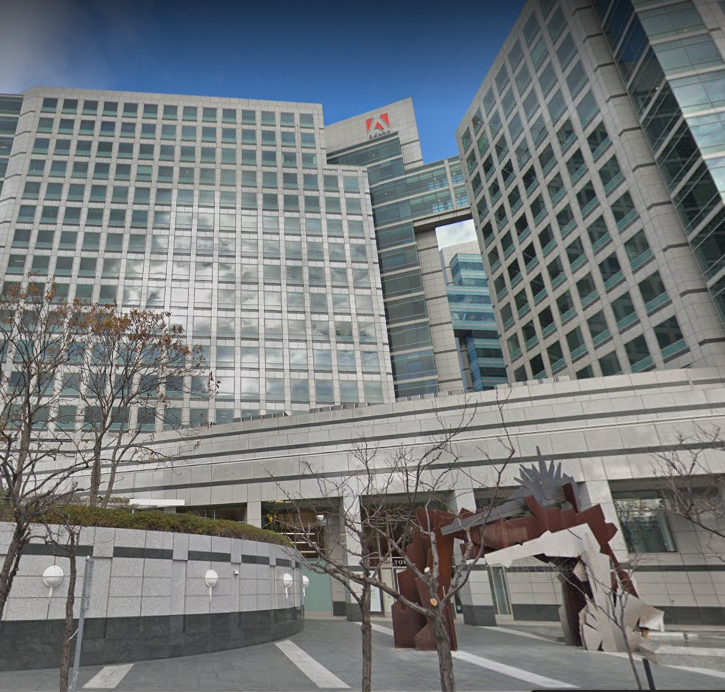 Readers may not be aware, for example, that while Adobe has published tools for customizing the interface, those tools have generally only supported the “latest” version of software. Indeed one of the most used tools (Configurator) has been abandoned and is no longer supported. Another tradeoff has been in how we document our features. For example the File -> Automate -> Batch method of stacking a folder full of files is workable, if inelegant. But we use the Photoshop Bridge method of feeding the stacker and like it much more for several significant reasons. One huge advantage of using Bridge is that you can actually see the content of the files. Another obvious advantage is that you are not constrained by what’s in your folder. 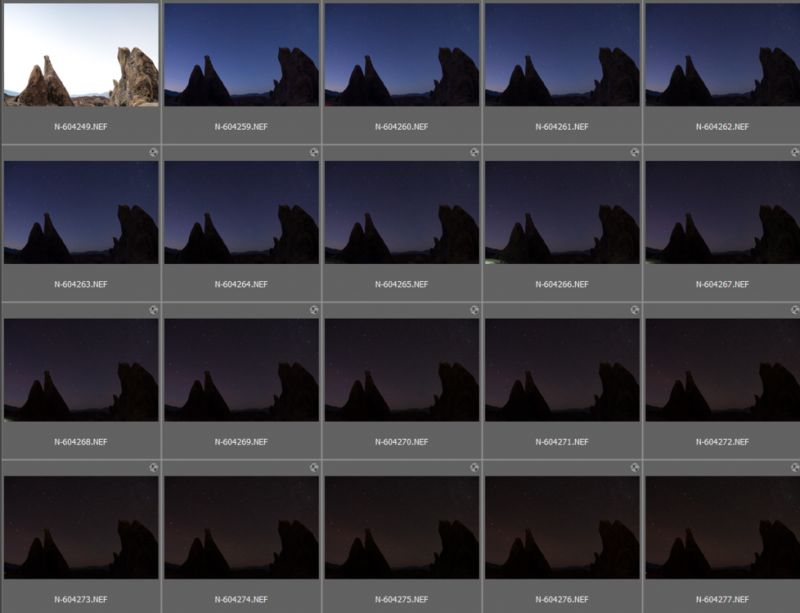 If you have 29 shots from one sequence and 120 of another sequence you don’t have to split those shots between folders. And, in fact, with Bridge to select files you don’t have to use the same stacking method for all the files of one set, or have files from only one folder! As noted above, version 14E is imminent. Surprisingly the biggest obstacle has not been the additional features, the primary obstacle has been packaging and delivering the content. Windows 8.1 and Mac OSX 10.9 have gotten very protective of their machines and throw up many roadblocks to try to keep your machine safe from viruses and trojans. This means we had to invest $1500 dollars to become an LLC, get signed up for the Mac developer plan, get a Mac code signing certificate and get a code signing certificate for Windows, too! That doesn’t include acquiring a Mac or polishing the scripts and installers on each machine. Here is what the problem looks like on a Windows PC using Internet Explorer without signed code (it’s just as bad with Safari on Mac). In fact, on both machines even though the code is signed (proving its provenance), you are still likely to get a warning like “This is not a commonly downloaded file”. It might be easier if we could email it to you, right? Except that Google, Yahoo and many others will not deliver an email that includes any executable content. Both PCs and Macs have reached this point described in a Mac advertisement from 2009 that pokes fun at Vista’s intrusive safety system. Guess what… both machines are becoming like this because there are so many, uh, jerks out there eager to harm you electronically. Our holy grail has been to create a single deliverable package that works both on a PC and on your Mac that we can document clearly, simply and as completely as possible. That was probably too high a goal. Installation now is as simple as clicking. A price increase. But current owners will get the upgrade for free. Some features we’re keeping under wraps for now. This entry was posted in Advanced Stacker, Photo Processing, Ravings, Stacking, Workflow and tagged add-ins, Advanced Stacker PLUS, ASP, compatibility, Continue, goals, Mac, OSX, PC, Photoshop Dialogs, security, stop, viruses, Windows on June 7, 2014 by Steven Christenson. We have been watching ourselves over our shoulders – yeah, kinda weird, right? Our goal is to figure out what it is we do the most to fix and beautify our photography – night photography in particular. We cover nearly all of these topics in greater detail in each of our NP150 – Photo Manipulation Webinars but we will hit the highlights here. So what are the 5 most used “tricks”? The first two topics are tackled below. The next two in the following article. Healing and cloning will get it’s own short article. First to be clear our goal is usually to make a compelling photo, not merely to represent reality. We do prefer realistic over bizarre, but we are not opposed to removing telephone wires and other distractions. We DO prefer natural looking scenes and eschew the over-the-top contrast and color saturation that seems to be the rage these days. We hate to be the first to break the news, but your camera is pretty clueless about what color white is. The camera will take its best guess. 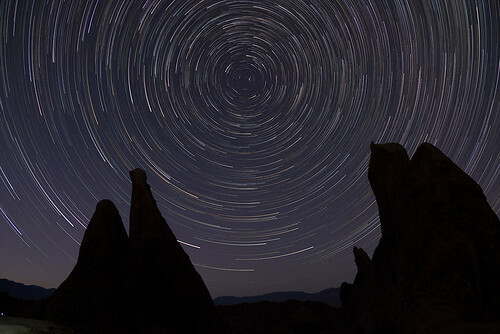 Our experience with night photography is that the camera choice is usually wrong – or at least unappealing. At its core white balance requires adjusting the red, green, and blue colors so that an area that should have a neutral gray or white color is actually gray – not tinged red, blue or green. 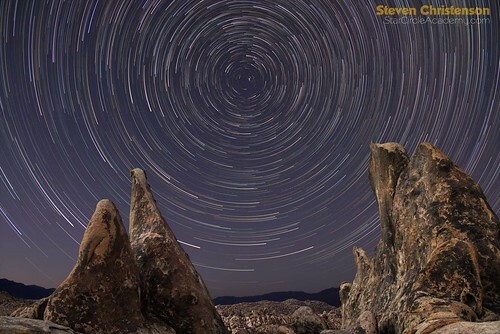 When shooting at night, understand that every light in the scene – including stars – has a different color bias (tint). 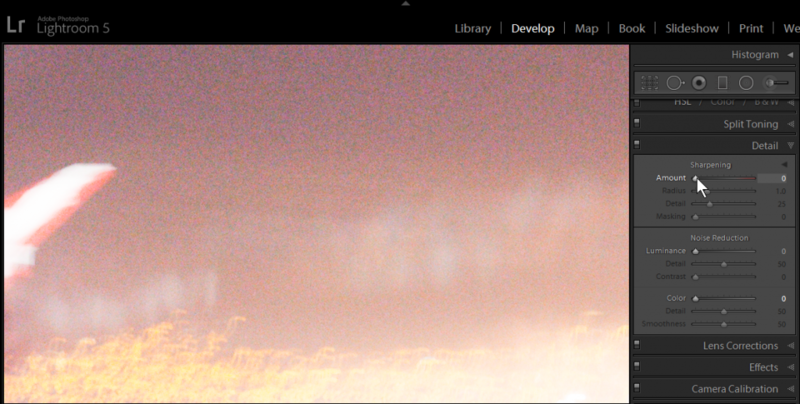 Sodium vapor lights for example are horrendous. Sodium vapor lights used in many streetlights are predominately yellow-brown and almost monochromatic. Under sodium vapor lights it will be impossible to achieve a natural color spectrum. You may want to adjust different parts of a night image separately. You may have to compromise and have a scene that has a bias of a pleasing kind rather than the ugly variety. 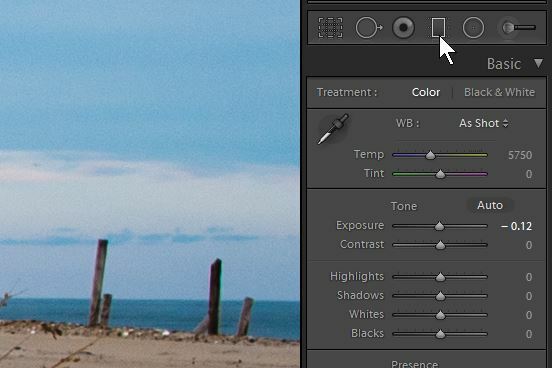 The easiest way to make the adjustment in Lightroom or Adobe Camera Raw is with the White Balance tool. It looks like an eye dropper. You click the tool, then click a gray area of the photo – if there is something that should be gray in the photo, that is. Even a white area is fine (but not an overexposed white). Stars are generally not good choices for gray-scale selection both because they are often over exposed and because many of them are NOT white! 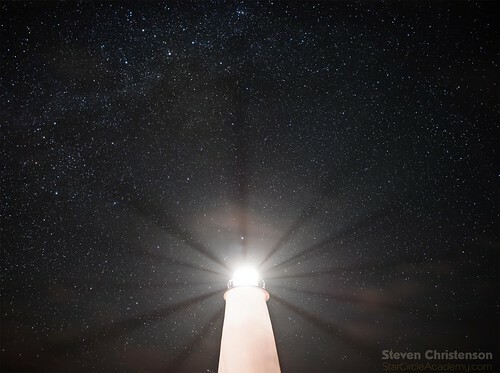 In the example below you see a photo of the Ocracoke Lighthouse which is definitely white, not the orange that resulted from sodium vapor lights. 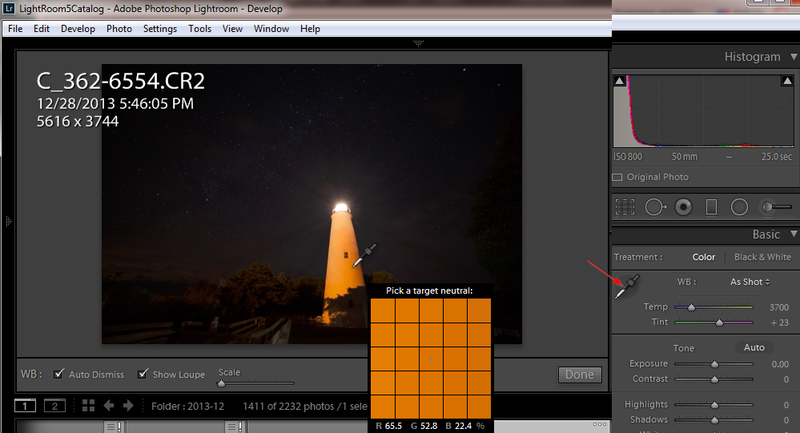 The dubious result of getting the lighthouse to its proper color via the white balance tool appears below. The sky and stars are unnaturally and artificially blue. 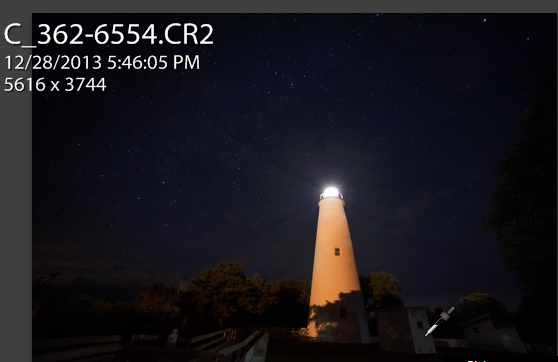 There are several solutions to this problem: color correct the lighthouse separately or compromise by warming (increasing the temperature) of the selected balance. Or try again by clicking elsewhere! By selecting a different location for the gray sample tool a better compromise can be achieved as shown in the photo below. 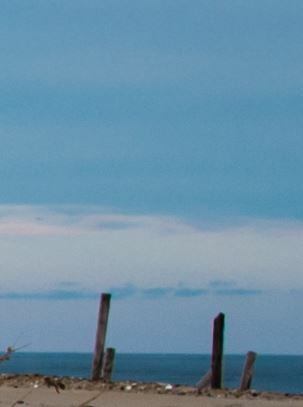 An examination of the scene reveals that the lighthouse is directly lit while the shed (near the bottom of the shot) is not. The shed and other areas in shadow are lit by ambient light reflected from many sources – including sky glow. 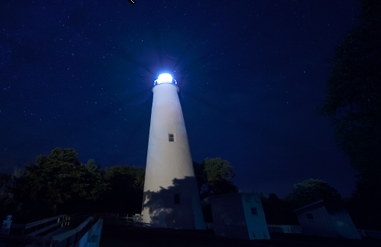 After selecting the shadow area the remaining white imbalance of the lighthouse can be handled by desaturating using the local adjustment brush – or leave it like it is. The same eyedropper style adjustment can be found in Photoshop, but you’ll have to hunt for it because the “Color Balance” Adjustment is not where you’ll find it! 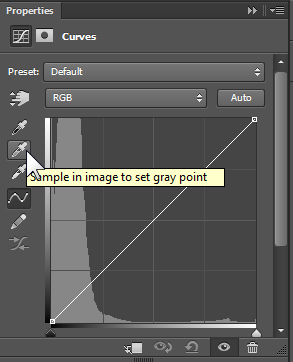 White Balance (gray point) selector of Curves in Photoshop. The gray point selector is also in the Levels adjustment. 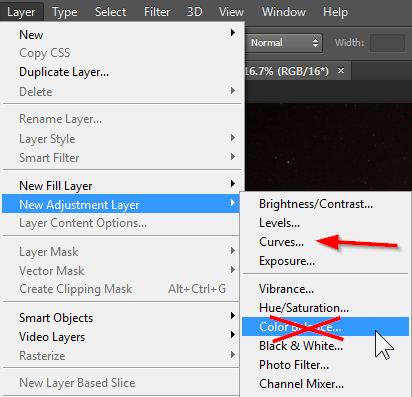 Note that in Photoshop you have two ways to go: use an adjustment layer, or use an Image -> Adjustments -> Curves (or Levels). We recommend using an Adjustment Layer because you can paint on the mask to control the effect and that makes it easy to adjust different parts of the image separately. 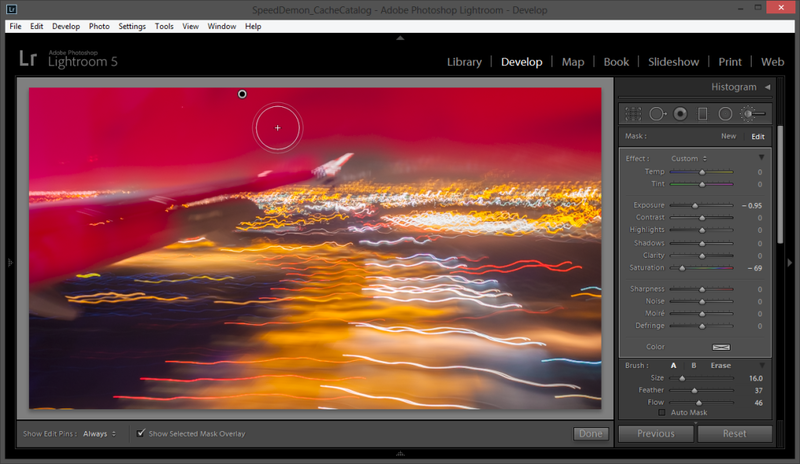 To adjust areas separately in Lightroom, use the Local Correction brush and adjust the white balance slider. Consider the following photo. With the new flight rules, you can use your camera while the plane is taking off or landing. Here the plane is landing at San Jose International Airport. There are two things about it that are good candidates for fixing. The first is the distracting glare of reflection from light inside the airplane (that’s due to Virgin America’s “Purple Ambiance”). We’d like to get rid of the distraction and it’s clear we will not be able to simply crop it out without giving up some of the interesting details. Glare from internal reflections leaves a blue cast. There is also noise in this one second, ISO 1600 exposure. 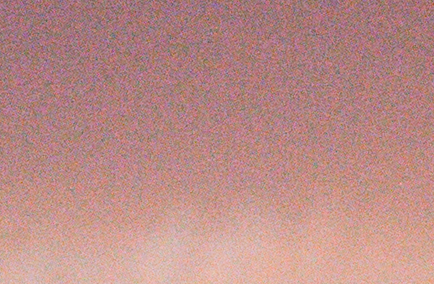 The second thing that is noticeable in the 100% (Zoomed view) is the colorful noise in the dark (and light) areas of the photo. No sky has grit in it – at least not like that! 100% View of the noise near the wing. We can tackle both problems separately or at once. 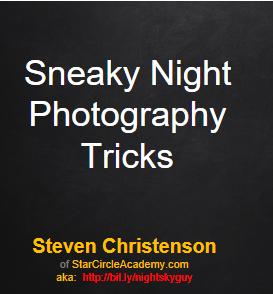 Selectively desaturating, and slightly darkening the blue glare is simple in Lightroom. 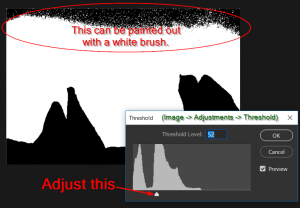 Select the adjustment brush (it looks like a face powder brush right below the “Histogram”), dial down the saturation, and slightly dial back the exposure. Then paint on the image where we want the change to occur. It may be useful to adjust the brush size, density and feathering. Here some feathering is important. We will not try to also increase the noise processing here, because the whole image needs some despeckling. Below the mask shows where we painted – and not particularly carefully, either! The Saturation was turned down to -69, and the exposure by almost a full stop. In a brighter sky we might not have been able to darken the touched up area as aggressively. The next thing we want to address is the noise. It’s everywhere in this photo. As we will learn in the next article, we often use noise reduction for smoothing things like blue (or dark) skies and in shadows where you would not expect to find details. 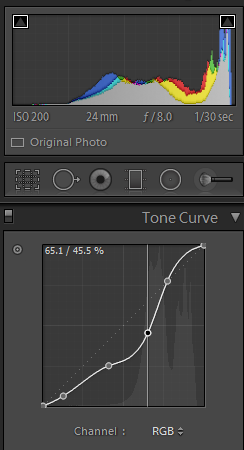 Using Adobe Camera Raw for saturation, exposure and noise reduction works the same way as in Lightroom it’s just that the adjustment brush is shaped differently and found in a different place. 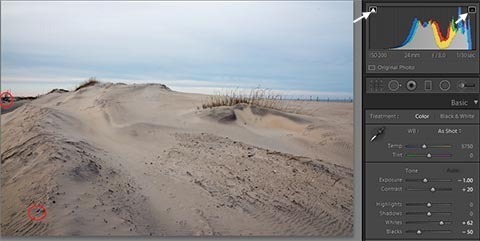 In Lightroom (and Adobe Camera Raw), there are two simple – and effective ways – to reduce noise in photos. 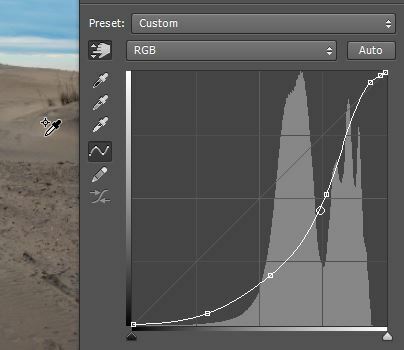 One is to selectively reduce noise using the “Noise” slider of the adjustment brush as we saw with our selective saturation adjustment. Moving the Noise slider to the right increases the amount of noise reduction but does not give you control over what KIND of noise reduction is performed. 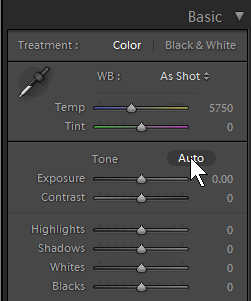 ACR and Lightroom have specific controls to reduce Luminance noise (dark and light speckles) and Color or Chroma noise (colored speckles). The noise reduction slider with the Local Correction brush does not let you control which type of noise reduction is applied. 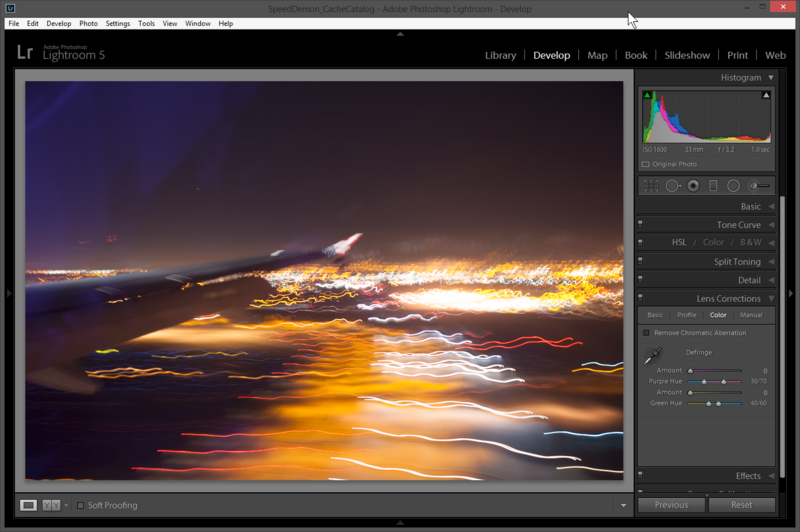 Sometimes correcting only the luminance noise is the best approach. 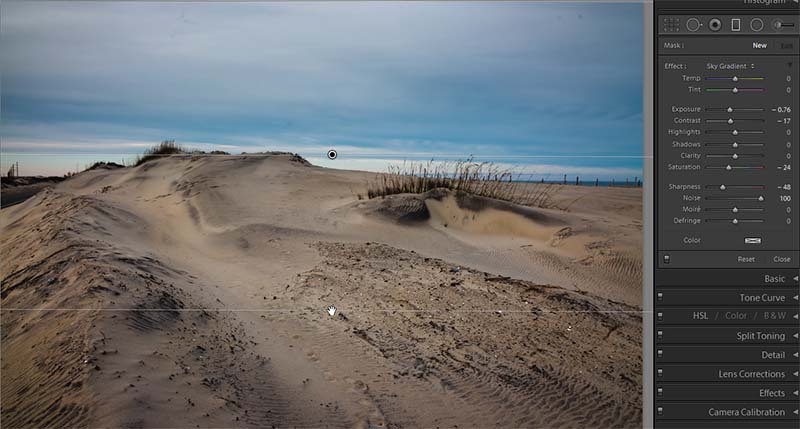 Both methods of correcting noise result in some blurring of the photo. How much blurring depends on how severely the sliders are adjusted. There is no formula for getting noise reduction to work well except to be careful not to over do it! Surprisingly, a little bit of noise makes a better photo. Indeed, there is an option to ADD noise in the “Effects” panel (called Grain). One thing to beware of: using the color noise reduction aggressively will result in loss of star colors in your night sky. In the examples below we’ve brightened the image to make the changes easier to see. Before any Adjustment, Turning off the default sharpness enhancement. The noise reduction portion of Lightroom is found in the Details section. Any controls used in this section will apply to the entire image – which is one reason adjustments should be made carefully and deliberately. 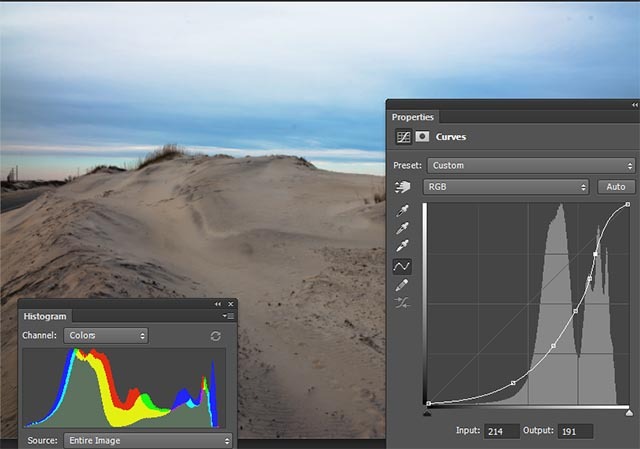 The first step we usually take is to eliminate the default sharpening that Lightroom wants to apply. We would rather selectively sharpen what needs sharpening than doing indiscriminate global sharpening. Next zoom in to 1:1 view of an area (Z key) where noise reduction is needed. For this pick a dark area where some details should be observable. It is also helpful to pick a dark area adjacent to a lighter area where sharpness is desired so the effect of noise reduction can be seen on two elements at once. We slowly bump up the luminance until we see less “grit”. Be sure to wait long enough to see the changes made in the image. We do not generally notice much difference with the detail and contrast sliders, but if we find ourselves adjusting as far as halfway on luminance and not getting what we want, we play with those sub-sliders. If we still have not achieved the correction we want, we bump the color slider as well… only much more carefully. If there is a LOT of color noise the color noise correction may be the slider to bump first. 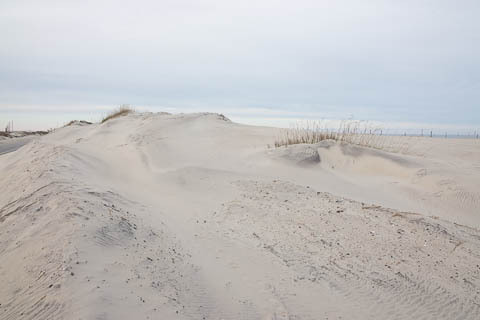 Once things are “almost” where we think they look right we choose another area to take a look. It is important to select an area of the photo that did not need much adjustment – usually a bright area. If the brighter area has become too blurred, we back off on the overall adjustment and then use a local adjustment to add still more noise reduction selectively. All adjustments made – note that perfect smoothness is not the goal! 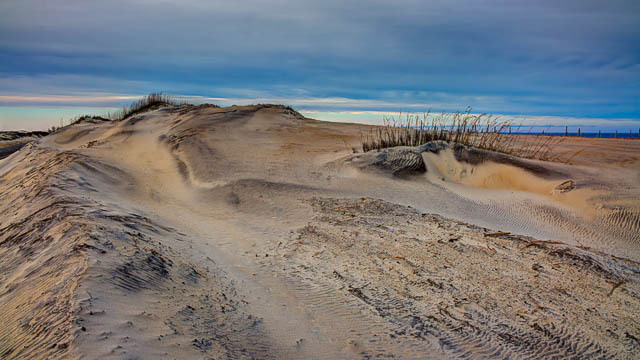 In Photoshop there are many more ways to reduce noise than those provided in Lightroom and Adobe Camera Raw. Our experience is that the noise controls in ACR and Lightroom are very good – better than any specific filters you will find in Photoshop. 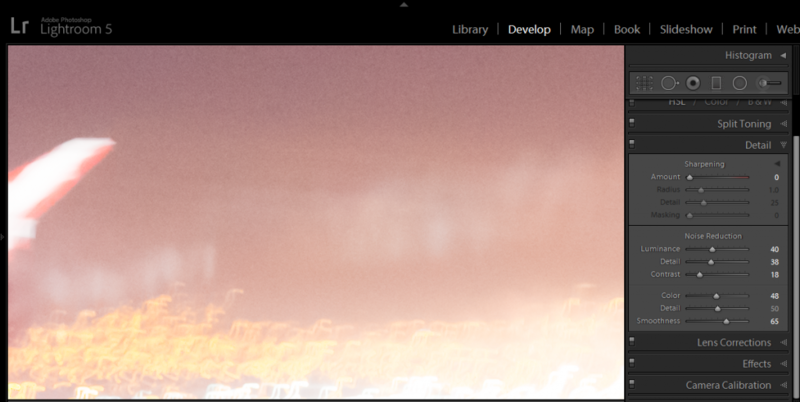 We do use Topaz Lab’s DeNoise photoshop plugin quite a lot however. 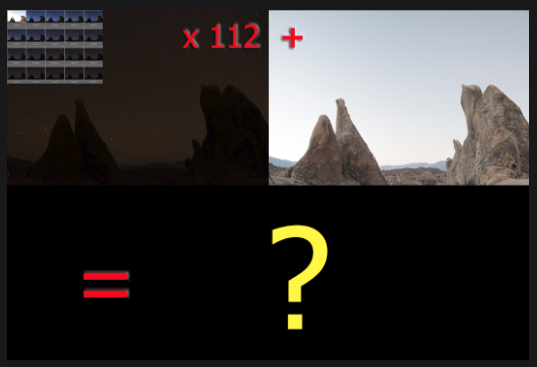 The best noise reduction method – when possible is to use the Simple Astrophotography Processing Technique. 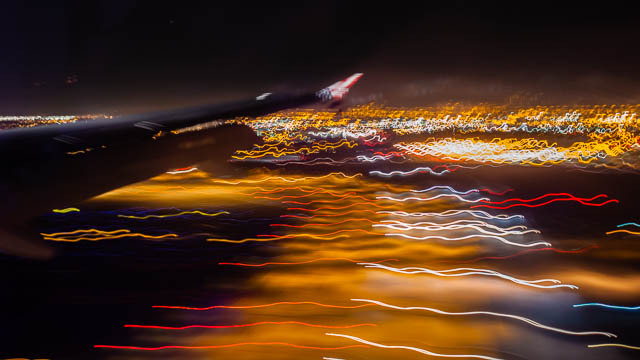 A photo like the one shown here is not a candidate, however, because that Astro technique requires multiple frames of the same image – that wasn’t possible here with the aircraft coming in for its bumpy landing. In the next article we will take on the remaining subjects, but you may have already figured out one of the techniques we use for desharpening – aggressive noise reduction! This entry was posted in Adobe Camera RAW, Color Correction, Lightroom, Noise Reduction, Photo Processing, Photoshop, Workflow and tagged adjustments, cloning, color correction, contrast, enhancement, exposure, healing, Photoshop, sharpening, skills, White Balance on January 28, 2014 by Steven Christenson.